A Taiwanese group of 16 business leaders is currently paying a visit to Europe with the aim of exploring trade and investment. The group, credited as Taiwan's most important economic delegation to Europe since the euro crisis began in late 2009, is seeking to boost Taiwan’s relations with Europe as Taiwan is working to expand its presence on the continent. 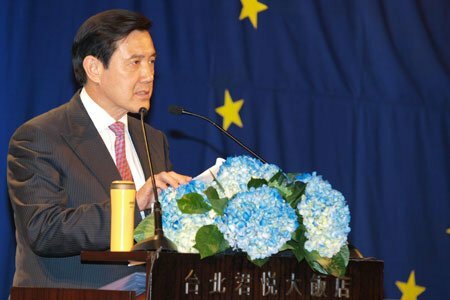 Taiwan is working hard to forge closer trade and economic relations with Europe and expand its presence on the continent, former Republic of China Vice President Vincent Siew said Wednesday [25 September 2013]. Siew made the remarks as he started a visit in Germany as honorary head of a high-profile Taiwanese business delegation to explore trade and investment opportunities. Noting that Germany is Taiwan's largest trade partner in Europe, Siew said there is plenty of room for both sides to expand cooperation. Germany is the second leg of the group's one-week visit to three countries. "We have been to Belgium and will travel next to France. We hope to help our European friends understand that beefing up trade and economic ties with Taiwan is mutually beneficial," Siew said in an interview with CNA. The Taiwanese group of 16 business leaders is being billed as Taiwan's most important economic delegation to Europe since the euro crisis began in late 2009. The members of the delegation held extensive talks with their German counterparts at the headquarters of the Federation of German Wholesale, Foreign Trade and Services (BGA) Wednesday morning. BGA Honorary Chairman Michael Fuchs, who is also deputy head of the CDU/CSU caucus in the German Bundestag, said at a reception in the evening that he has many business partners and good friends in Taiwan. Fuchs, who headed a trade delegation to Taiwan in May , said Taiwan is an ideal joint venture partner for Germany because it has rich opportunities and is trustworthy. The CDU/CSU coalition scored a resounding victory in Germany's parliamentary elections this week. Fuchs said there are many new members in the Bundestag and he promised to help them learn more about Taiwan. In his speech at the reception, Fuchs also mentioned the importance of the improved relations across the Taiwan Strait. The opening of direct cross-strait transport links, for instance, has made it easier and far more convenient for him to visit both Taiwan and China, he said. The reception was co-hosted by the BGA and Taiwan's representative office in Germany in honor of the Taiwan delegation. The group is being led by Kenneth C. M. Lo, chairman of the Chinese National Association of Industry and Commerce, Taiwan (CNAIC), with Siew lending clout as its honorary leader. Lo said the group has held discussions with German industry executives on a range of topics, including energy conversion and management, electricity prices, data security in the Web era and minimum wage issues. "We have learned a lot from the German experience," Lo said. In addition to visiting the BGA headquarters, the group has also met with Bundestag Deputy Speaker Hermann Otto Solms and visited the Association of German Chambers of Industry and Commerce.